In May 2010, our last summer living in Los Angeles, I took yet another "urban hike," this time up Pico Blvd from Santa Monica into the heart of Los Angeles. I parked my car at Ocean Avenue, a block from the beach, and started heading inland. There was free street parking, but only 'till 9am - so my time was limited. 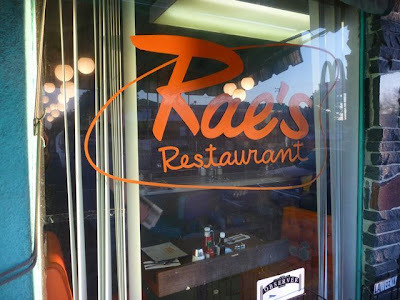 One exception is Rae's Restaurant at Pico and 29th Street. Rae's is an old school diner, and has been used for dozens of movie shoots, TV shows, and commercials. 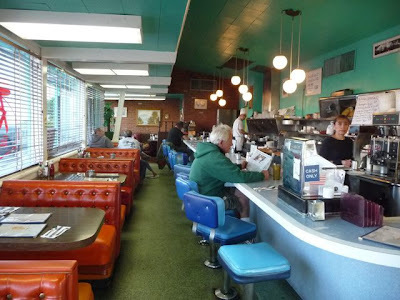 Love the "cash only" sign next to the register. Sunrise featuring Santa Monica Mountains, the office towers of Century City, and the obligatory barbed wire. There's something about this photo that just says "Los Angeles." Store front at Pico and 30th. 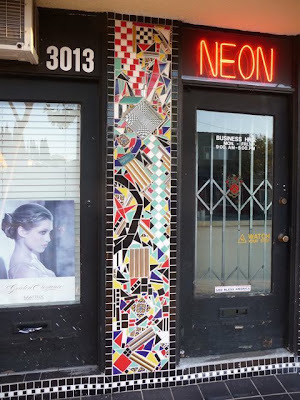 Beautiful, unique tile work. Neon that says NEON. 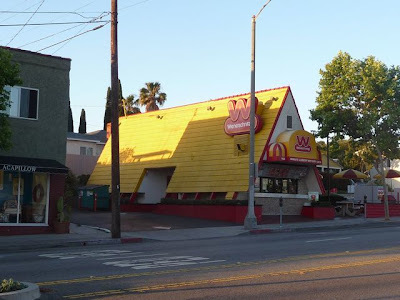 Normally a Der Weinerschnitzel Hot Dog stand wouldn't catch my eye, but a loud and cheery fast food chain seemed so out of place in this part of Santa Monica, I had to take a photo. This part of town has gotten so "hip" and gentrified, the bright yellow roof stands out as a monument to another era. In contrast, Unurban Coffee across the street fits right in. 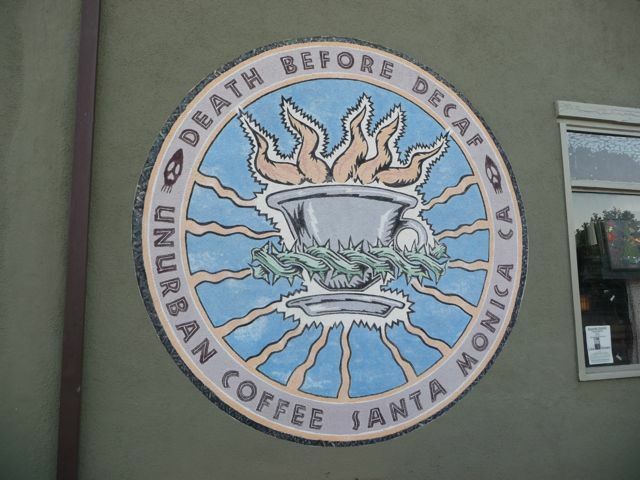 Small, independent coffee shops, stores, and restaurants are found all over Santa Monica. If everything is "unique," then is anything really unique? 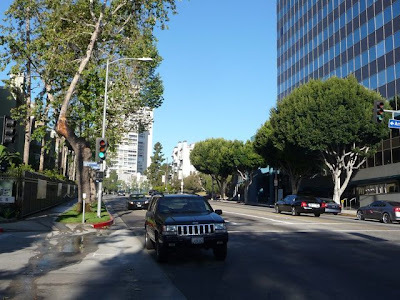 Walking under the Santa Monica Freeway, I crossed over from the city of Santa Monica into Los Angeles city limits. You honestly wouldn't know unless you were looking at a map. 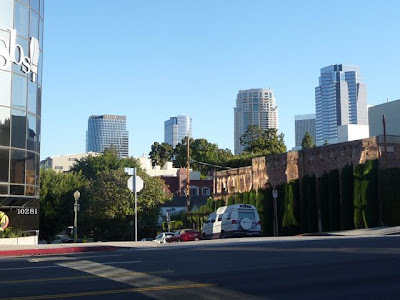 There definitely isn't a sense of "leaving" one city (Santa Monica, Culver City, Beverly Hills, West Hollywood) and entering Los Angeles, aside from - perhaps - a different style of street sign. 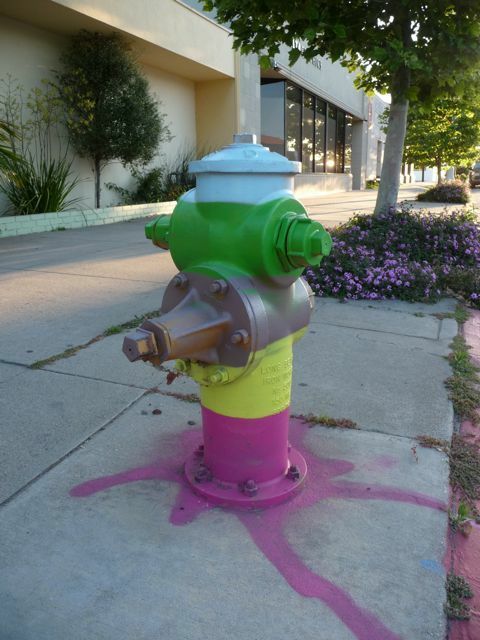 I came across this fire hydrant a block or so east of Bundy. 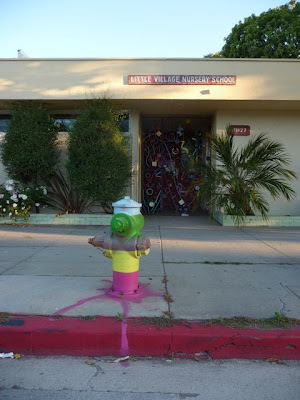 I love how the paint pours into the curb. Fun, creative. It's in front of "Little Village Nursery School" - makes sense. Did they get permission from the city to do this? Probably not. In some ways, that's what makes it so great. Sunrise on Pico. I'm not sure what it was, but there was something very special about this moment. Looking back west. 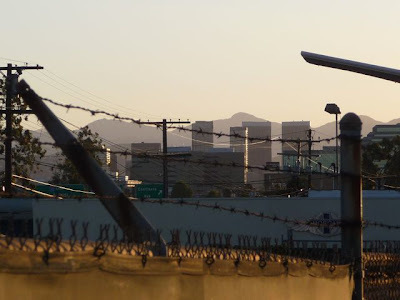 The Santa Monica Freeway overpass is visible in the distance. It was honestly a very beautiful morning. In an hour or so, these streets would be jammed with traffic, but right now it was very quiet, very peaceful. Here's a link to the same stretch a week before. Don Antonio's Mexican Food near Pico and Barrington. 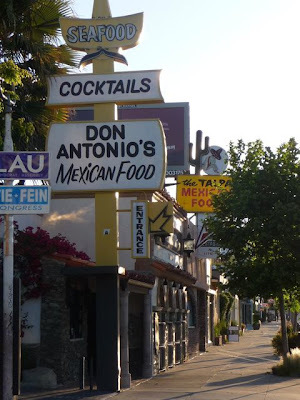 Love the 60's era signage. I think it's moved from "tacky" to "classic." 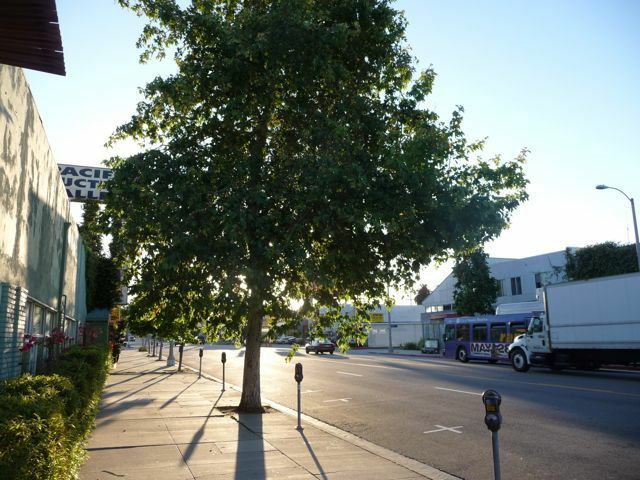 This stretch of Pico has some amazing street trees, sycamores to be exact. 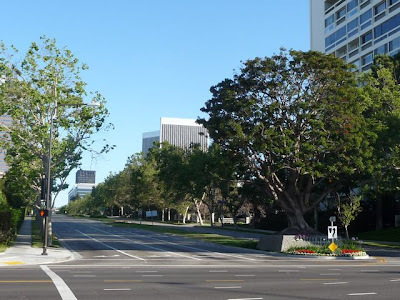 To those of you from other parts of the country, large street trees may or may not be a big deal, but these trees are amazing, especially in such an urban environment. 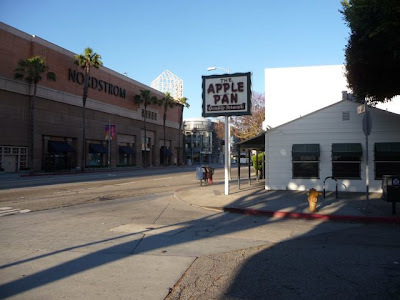 The Apple Pan restaurant near Pico and Westwood, another old school restaurant here on the westside of Los Angeles. It's gotten rave reviews on Yelp and other sites. I wanted to take my kids here - but they said "no way" (too bad for them!). 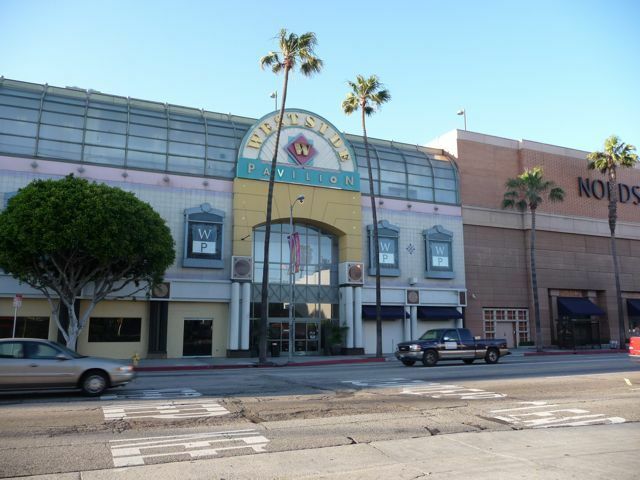 The Westside Pavilion - West L.A.'s answer to the suburban mall. Yes, there's a parking structure in the back. It's got the usual suspects in terms of retail stores you'd find at most malls. And like most malls, I try to stay far far away - although I'm pretty happy with the shoes I bought at Nordstrom. On a similar walk the week before, this is where I stopped and took the bus back. I was on a roll and still had plenty of time to keep going. How far could I walk, and still catch a bus back to my car before 9am? 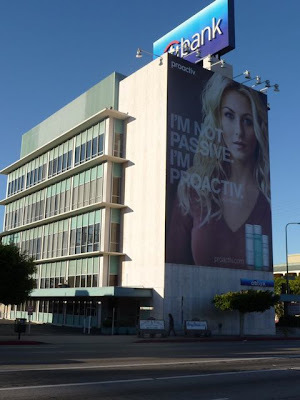 Billboard on the side of what looks like a 1960's era medical building. 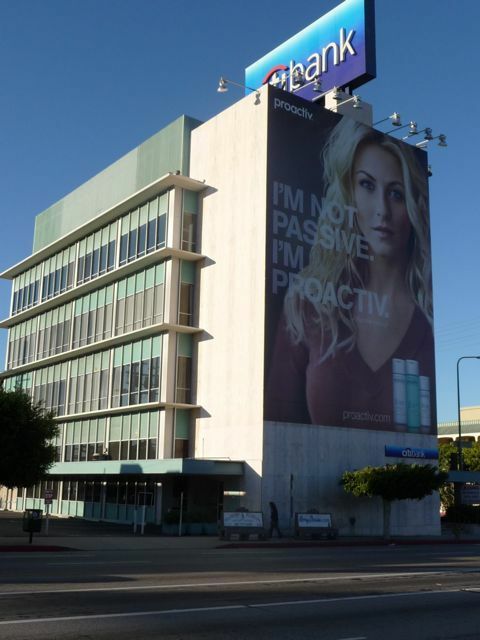 These are all over the city - in some cases, multi-story ads actually cover the windows. 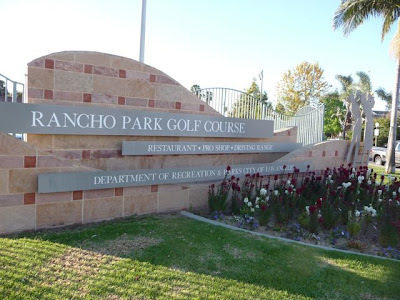 While I was in High School, friends of mine and I played golf a couple times at Rancho Park Golf Course. One online reviewer commented: "Friendly, fun, cheap, charming and consistent. 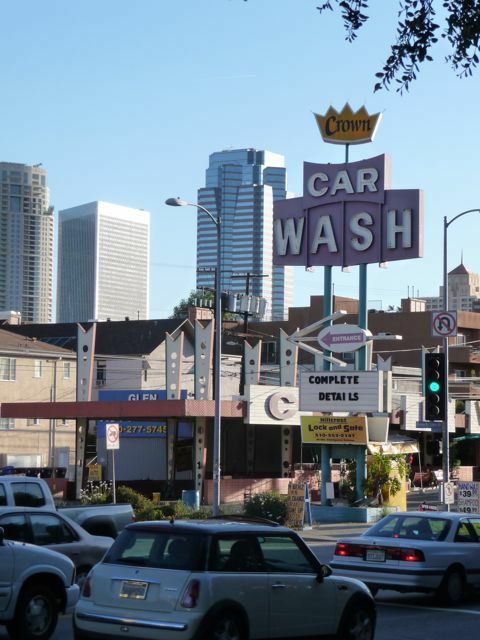 Nothing like it in L.A. or any other big city I've lived in. "‎ ‎ Nice. 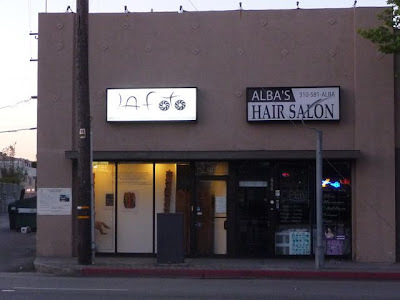 This is at the corner of Pico and Patricia Avenue - There's another entrance off of Motor Avenue. 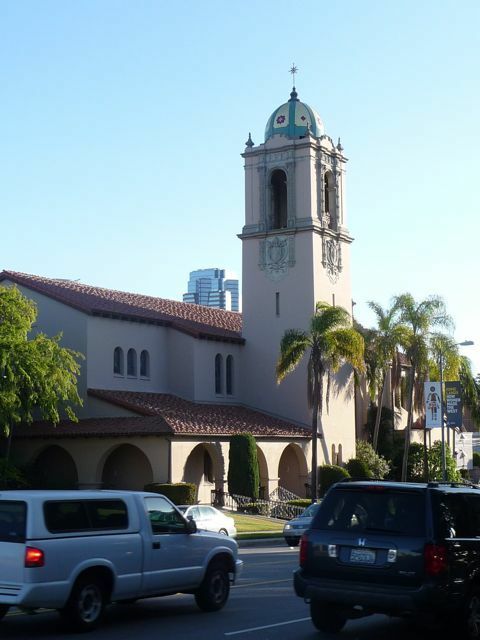 The bell tower of Saint Timothy Roman Catholic Church, located on the corner of Pico and Beverly Glen Blvd. 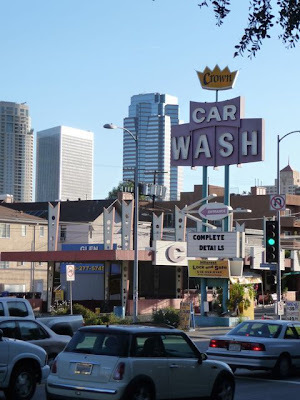 Across the street, and on the same corner is Crown Car Wash. Like Don Antonio's Mexican Restaurant, I think this has moved (or is moving) from "1950's tacky" to "mid-century classic." 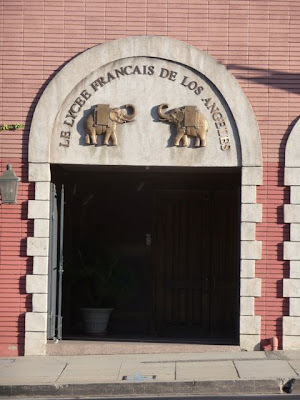 Le Lycee Francais. 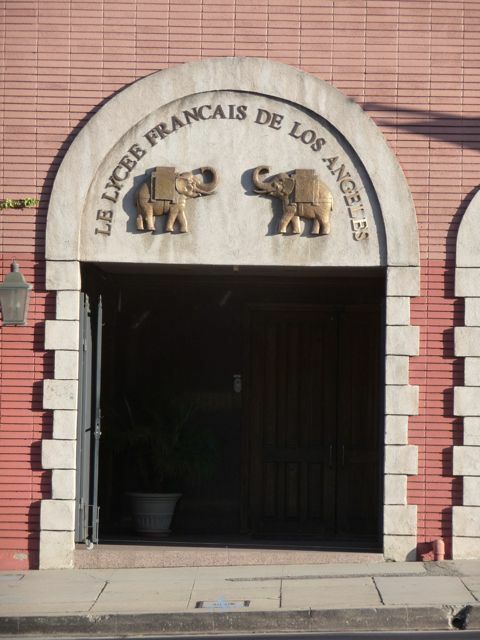 Nothing quite says "French" like "elephants." Located next to the Lycee Francais, on the corner of Pico and Kerwood, is the Carl Jung Institute. OK, what in the world is this? According to their website, the institute is "a non-profit organization dedicated to the study and dissemination of the view of C.G. Jung." O-Kay . . . 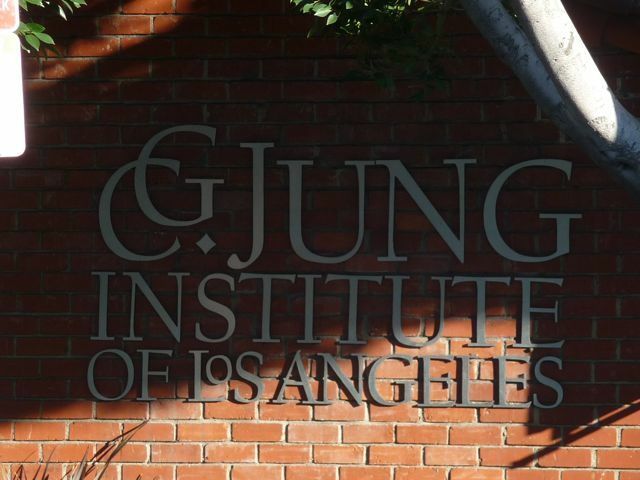 Apparently, there are similar institutes in New York, Chicago, San Francisco, and Boston. On the next block, and to my left, the office towers of Century City. 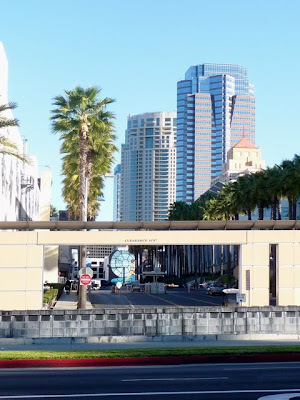 The tall building slightly to the right is the corporate headquarters for 20th Century Fox. Former President Ronald Regan maintained an office here after leaving the White House, and it was the office building featured in the 1988 film Die Hard (hence, I refer to it as "The Die Hard Building"). To my right, and through a fence, a view of the very beautiful Rancho Park Golf Course. 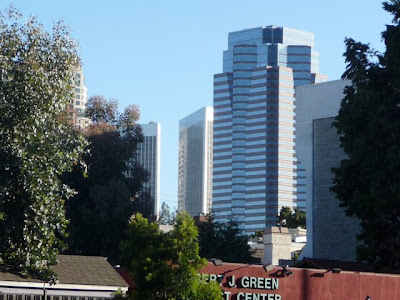 The office towers of Century City. 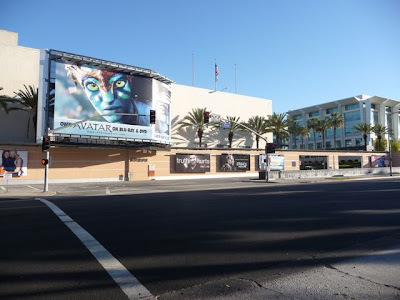 The 20th Century Fox Studios are located on the corner of Pico and Motor Avenue. 20th Century is one of the six major Hollywood Studios. 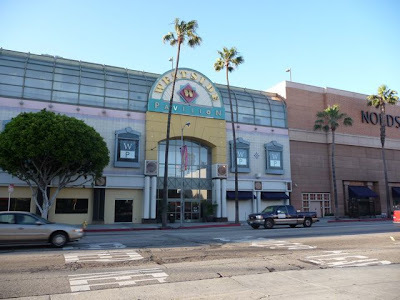 The others are Sony (located in Culver City), Disney, Warner Brothers, Universal (all located in the San Fernando Valley) and Paramount (the only studio actually located in Hollywood). In front of 20th Century Fox were billboard ads for the April 2010 DVD release of Avatar (which I've successfully avoided seeing - so far). 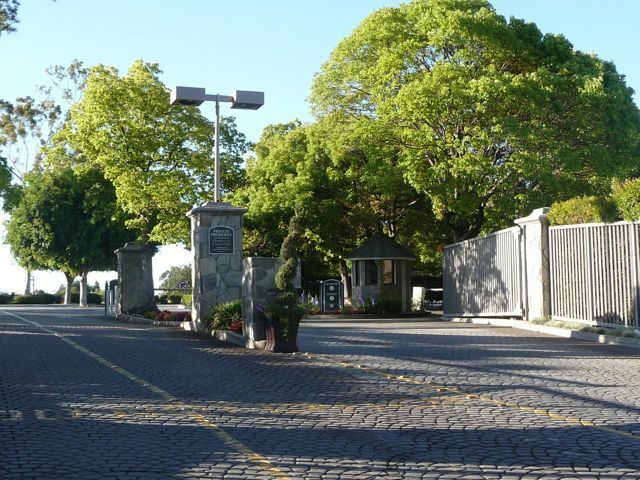 If you look carefully, you'll see the guard house just inside the entrance. Back around 1991 a friend working at Fox gave me a tour of the studio. Got to have lunch in the commissary; saw comedian Mel Brooks walking around. 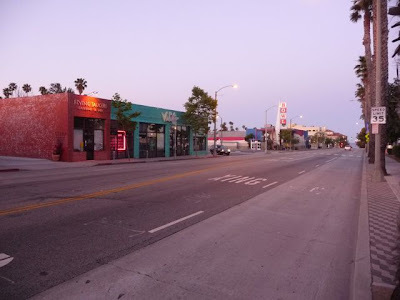 Really unique L.A. experience. As an aside, Fox and Disney are the only studios that do not offer any kind of studio tour. Walking by was a bit like walking by the Wonka Chocolate Factory in the Roald Dahl novel. Pico and Avenue of the Stars. 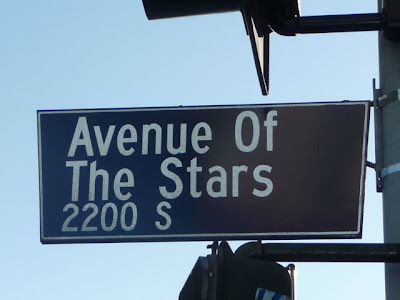 My dad had an office at 1801 Avenue of the Stars (on the corner of Santa Monica Blvd.) back in 1970's, so I felt like I had to get a picture. Looking northwest up Avenue of the Stars. Century City is a large office and residential complex located on the former backlot of the 20th Century Fox Studios. Fox sold 180 acres of their backlot to developer Alcoa in 1961, with the first building (my dad's old office building) opening in 1963. The Century Towers at the corner of Pico and Avenue of the Stars. Designed by world renowned architect I.M. Pei, the Century Towers were built in 1964. 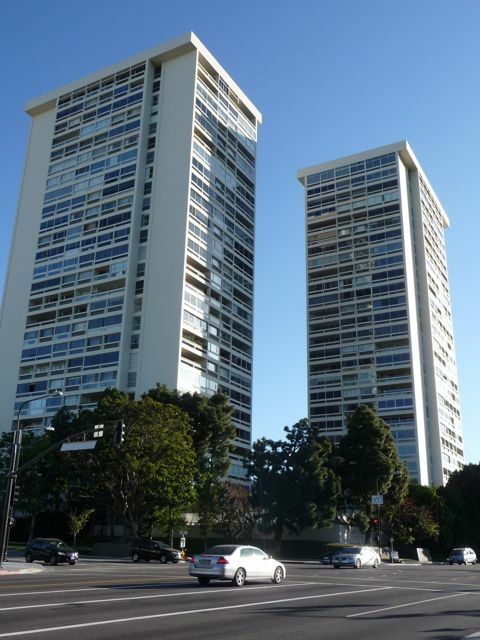 They were converted to condominiums in 1972 - with 1600 square foot condos currently listing for $1.8 million. 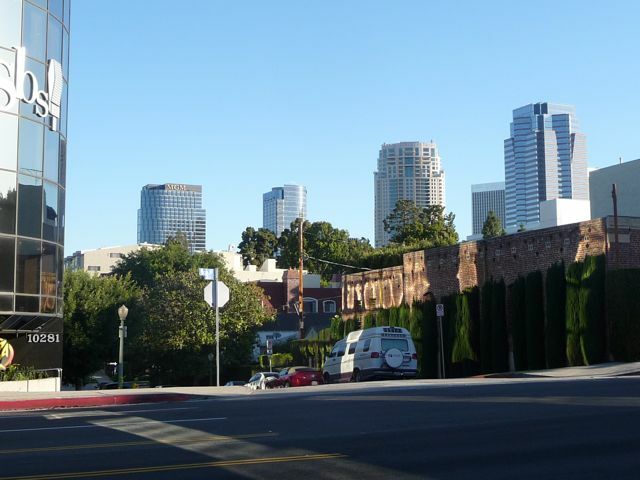 Originally, Century City was going to have dozens of residential towers like this - but the surrounding communities put the cabash on that. Just up the street is the entrance to the Hillcrest Country Club. 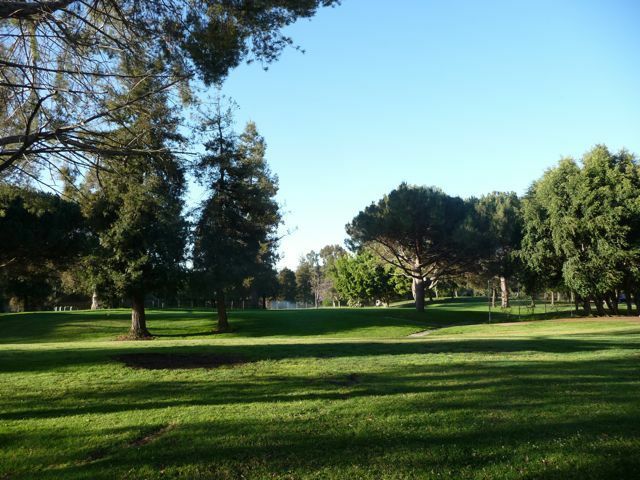 For years, Jews were barred from membership at the Los Angeles Country Club, located a mile away - so they created their own, equally impressive, country club. Members have included studio heads and many of Hollywood's most famous actors including Grocho Marx, Milton Berle, Jack Benny, Danny Kaye, George Burns. Considering it's "who's who" of members past and present, it has an extremely understated entrance. 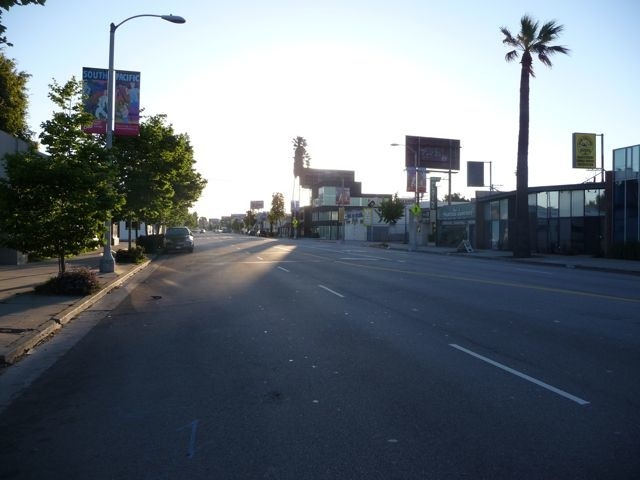 Pico Blvd, looking back west towards Century City. 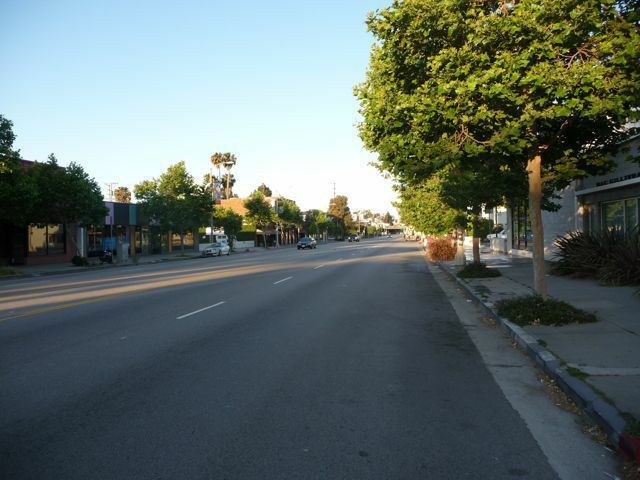 This area of Los Angeles, east of Century City and just south of Beverly Hills, is known as Pico-Robertson. There are twenty synagogues operating in the community - yes, it has a huge Jewish community.